Ms. Biernacki wanted two things for her classes. Firstly, she wanted us to teach her Grade 10 History class how to use Prezi in order to enhance their ISP presentations. In addition, she wanted us to help develop her websites by adding images, documents and embedded videos. We created a step-by-step tutorial (on Microsoft Word) on how to add images onto the website, as well as a FAQ in case she had any additional questions. We did not make separate tutorials for adding videos, etc, simply because it requires the same process as inserting images. Sincerest apologies we did not complete this for the beginning of class. For her websites, she wanted us to put up the codes from the library so that her students would be able to access the passwords from home. Additionally, she provided us with various (hard-copy) notes (and a comic book) that she wanted us to scan and upload onto her website. We basically scanned all the pages and uploaded them onto her Canadian History website. At first, she had wanted us to showcase her class how to use Prezi in order to enhance their ISP presentations. We created a lesson plan, and we were planning to use the Prezi that the Prezi group made in class. However, in the end, she decided that she did not want to use Prezi, and instead would use PowerPoint. Therefore, even though we had everything prepared, the lesson did not occur. Anything is possible with Google Sites. This is a simple and easy way for teachers to share class material and due dates with their students. Google Sites also does not require teachers to have a Google Account. 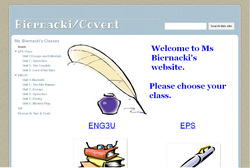 They are able to use their own personal emails or TDSB emails to host the site. Additionally, the Google Site is highly compatible with the Google Calendar. Teachers from different subjects - from Art to Physics - can use a Google Site to post up notes, due dates, and announcements. Teachers can upload handouts and students will be able to download and print them - especially at home. This will decrease the number of students whom do not have notes due to an absence. Images, videos are also some of the other options available on Google Sites. The possibilities are endless with this application.